Menu -> Contacts -> Options and scroll all the way down to Phonebook Setting. There, you can switch the Storage Location from SIM card to Phone Memory. Once you do that, you'll be able to store extended info for each contact including email addresses. Now you can go back and add a contact name and email address for that contact. Use the "1" key to add the "@" symbol. Now you can finally send a text message to that contact. 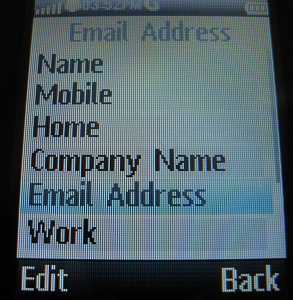 To test it, I recommend creating an email contact for your own email address to see what it looks like coming in. 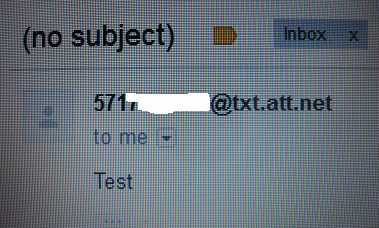 As you can see in the screenshot, the message comes from ten-digit-number@txt.att.net which confirms that Consumer Cellular uses the AT&T network. To email a message back to your phone someone simply has to send the email message back to ten-digit-number@txt.att.net (by hitting reply) and you should receive it. Someone could also send a message to the mms.att.net address, but that will be cost more minutes and be more of a hassle to receive. Return to Consumer Cellular Motorola WX345.